My Newborn Failed a Hearing Test in Both Ears. What Should I Do? For most parents, newborn hearing tests are just a formality. They are a courtesy service provided in the hospital – just days after welcoming your baby into the world. But what happens if your new bundle of joy fails these routine hearing exams? It’s not uncommon to request an additional screening, just to be sure. After all, maybe the hospital’s equipment is faulty, or perhaps the next results will be different with further testing. Eventually, the realization begins to set in, and you strongly suspect that your newborn is hard of hearing or possibly deaf. When the hearing loss is localized in just one ear, this can be bad enough. And we have a separate article for families in this category. However, very few parents are prepared to learn their child has a hearing loss in both ears. With this discovery, a flood of new and terrifying questions can pop up. How will my baby handle the challenges of the world? Will he or she be able to make new friends in school? Will my child grow up to lead a normal and happy life? Concerns like these are perfectly natural. If left untreated, any developing child with hearing loss can and may endure major hurdles. With early diagnosis and proper intervention, your baby can go on to lead a happy, productive and fulfilling life alongside his or her hearing peers. And this is precisely where CCHAT can help. Launched in 1996, CCHAT helps children who are deaf or hard of hearing matriculate into mainstream schools throughout Sacramento County. Note: This is not an overnight thing. It’s a multi-step process that requires time and patience. 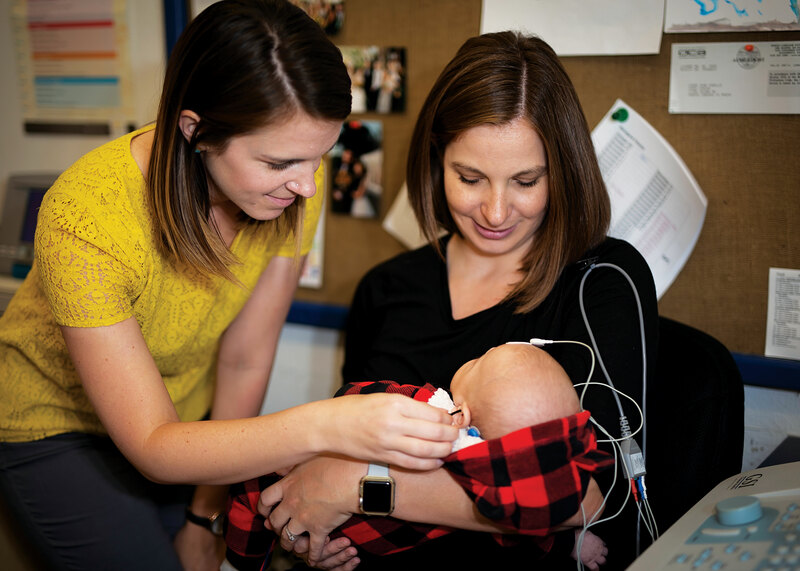 If you suspect that your newborn may be deaf or hard of hearing, the first step involves conducting a more thorough evaluation of your child’s hearing capabilities. Newborn screenings performed at the hospital are not always conclusive. Even with 100% accurate testing, hospitals cannot necessarily determine whether the hearing loss is severe or mild – permanent or temporary. This is why we follow up with natural sleep Auditory Brainstem Response (ABR) testing to ensure your child receives a much more thorough evaluation. This exam allows us to pinpoint the root cause of your newborn’s hearing loss – since the most appropriate treatment options can vary. Most of our exams are less than 2 hours, and from the moment you schedule an appointment with our on-site audiologists, the average wait time is less than 1 week. We accept MediCAL, California Children Services (CCS) and many other private health insurance programs. Additionally, CCHAT is open to discuss payment options if paying entirely out-of-pocket. To request a hearing exam for your baby today, click here. The Results Confirm My Baby Is Deaf or Hard of Hearing – What Now? If the results conclude that your baby is deaf or hard of hearing, there are several different treatment options we can explore. While no solution can ever fully “restore” hearing, it’s possible to amplify sound or improve how auditory information is transmitted, received or processed. Two of the most popular treatment solutions include hearing aids and cochlear implants – both of which are suitable for babies who are just weeks old. We can also set up connections with area audiologists who specialize in customizing, fitting and testing these assistive hearing technologies. CCHAT has a year-round program designed to prepare children who are deaf or hard of hearing merge into mainstream schools along with their hearing peers. And as it’s never too early to explore hearing aids and cochlear implants, it’s never too early to enroll your child in CCHAT. In fact, we even have a dedicated Baby & Me program – designed exclusively for newborns and their parents. If you suspect your baby has a hearing loss in one or both ears, don’t delay. The sooner you intervene, the better equipped your baby will lead a normal and productive life. To learn more about our diagnostic hearing exams for newborn babies or about our carefully designed curricula for children who are deaf or hard of hearing, schedule a free consultation with CCHAT today.